I have written about UNCG, UNC Greensboro, spending like drunken sailors before. Once again, in one of the worst economies since the Great Depreciation, they are raising student tuition due to their unchecked spending. Between the UNCG Administration, Obama and Obamacare, these students have a uphill struggle. From the Greensboro News Record October 30, 2013. “Some UNCG students and faculty members will speak out on campus today against the university’s plans to build a new recreation center — and the costs that go with it. UNCG students pay $707 a year to repay construction costs for six existing facilities and one planned building. That’s the highest debt service in the UNC system. The bulk of this debt service fee — $435 a year — goes toward a new student recreation center that UNCG plans to build on West Lee Street on the edge of the Glenwood neighborhood. The $91 million facility, more than twice the size of the current rec center, is scheduled to open in fall 2016. Juan Miranda, a UNCG graduate student and alumnus, said the project’s size and cost is too much. 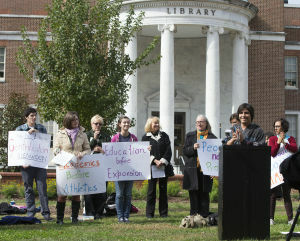 “Some UNCG students and faculty members spoke out Wednesday against the proposed construction of a new student recreation center on campus. From Citizen Wells August 20, 2012. “Michelle Obama spoke at UNCG a few weeks ago. Obama lies versus Obama reality. From the front page of the Greensboro News & Record August 20, 2012. “UNCG about two weeks ago canceled the registrations of about 1,300 students because they had yet to pay their tuition bills — the highest number of cancellations since fall 2009, university officials said. N.C. A&T is also seeing an increase in the number of students facing cancellation. The schools’ officials attribute their numbers to a variety of factors, including tuition increases and cuts and other changes in state and federal financial aid programs. “Every lost soul is unacceptable to me, and it really hurts when we have to cancel that many registrations,” said Steve Roberson, UNCG dean of undergraduate studies. By Friday, UNCG had managed to whittle that number to just 500, according to preliminary data. But administrators are concerned about the large number of students who are having trouble paying this year. UNCG Vice Provost Alan Boyette said recently that some students ran into problems because they did not apply for financial aid on time, or their financial aid had not yet been packaged. So, he expected that initial number would be reduced. He said enrollment this year is “really unpredictable.” The university is gauging payments and registration on a near daily basis to get a feel for what the final number will be, he said. “We think the timing is clearly related to the current economy,” Boyette said of the number of students paying late. Sarah Carrigan, UNCG director of institutional research, said Friday that UNCG canceled 1,300 student registrations between July 31 and Aug. 8. That’s an increase of about 500 over last year at that same time, she said. As of Friday, about 800 of those students had paid to register again, Carrigan said. A&T has also had a slight increase in the number of students who risk having their registrations canceled, said Akua Matherson, the university interim associate vice chancellor for enrollment management. As of late Friday afternoon, the university was scheduled to cancel the registrations of 541 students, Matherson said. That’s a 2.5 percent increase from last year, she said. Those students had until the close of business Friday to make some kind of arrangement to keep their registration. Staff from both universities spent much of the summer reaching out to students who were eligible to return to school but had not registered to find out what their problems are and to offer solutions. More than 80 percent of A&T students qualify for need-based aid. Staff members have talked to families whose financial situations have changed, such as one parent losing a job. “Some of our students are looking at some real challenges,” Matherson said. Deborah Tollefson, UNCG financial aid director, has heard similar stories of parents’ stretched incomes. She said that counselors steer students away from private loans. Instead, they inform them of such options as federal loans, part-time campus employment and tuition payment plans if they are having trouble paying. Tollefson said that UNCG has received a lot of late financial aid applications this year. Students who didn’t have to take out loans two or three years ago are now having to but are unfamiliar with the process, she said. A&T had 10,590 students enrolled as of Wednesday, the first day of classes. With the Obama economic plan we get higher tuition, much higher health care costs and higher unemployment. From Citizen Wells February 12, 2012.
fee hikes over the next two years. I have met and talked with many college students. Recently a UNCG student, who is struggling to support his family and attend school, confided in me that the recent tuition and health care increases (mandatory health care insurance almost doubled) could force him to leave school. From Citizen Wells May 2, 2012. “The UNC system began requiring students to be covered by health insurance in the fall of 2010. Students must either prove that they have their own insurance or buy a plan offered by the UNC system. Before that, 11 campuses required insurance; rates and coverage varied significantly among the schools. On top of rising tuition and fees, those UNC system students who buy the university-sponsored health insurance plan will face steep premium increases in the next academic year. From Citizen Wells July 27, 2012. “North Carolina’s statewide unemployment rate (not seasonally adjusted) was 9.9 percent in June. This was a 0.4 of a percentage-point increase from May’s revised rate of 9.5 percent, and a 1.0 percentage-point decrease over the year. When I wrote “Obamacare helps entitlement crowd” I meant only in the short term monetary sense because ultimately it will hurt all Americans and their healthcare. A 2010 study analysis by Wyatt Emmerich concluded that welfare pays. He found that a part time worker receiving a wide range of entitlement benefits could fare better that a family earning $ 60,000 per year. From Zero hedge November 22, 2010. “Tonight’s stunning financial piece de resistance comes from Wyatt Emerich of The Cleveland Current. In what is sure to inspire some serious ire among all those who once believed Ronald Reagan that it was the USSR that was the “Evil Empire”, Emmerich analyzes disposable income and economic benefits among several key income classes and comes to the stunning (and verifiable) conclusion that “a one-parent family of three making $14,500 a year (minimum wage) has more disposable income than a family making $60,000 a year.” And that excludes benefits from Supplemental Security Income disability checks. America is now a country which punishes those middle-class people who not only try to work hard, but avoid scamming the system. Not surprisingly, it is not only the richest and most audacious thieves that prosper – it is also the penny scammers at the very bottom of the economic ladder that rip off the middle class each and every day, courtesy of the world’s most generous entitlement system. Perhaps if Reagan were alive today, he would wish to modify the object of his once legendary remark. This analysis was pre Obamacare. The unfairness is even worse now. From the LA Times October 26, 2013. “Thousands of Californians are discovering what Obamacarewill cost them — and many don’t like what they see. Fullerton resident Jennifer Harris thought she had a great deal, paying $98 a month for an individual plan throughHealth Net Inc. She got a rude surprise this month when the company said it would cancel her policy at the end of this year. Her current plan does not conform with the new federal rules, which require more generous levels of coverage. Here is a copy of an original Wyatt Emmerich from the Wayback Machine archives. Remember when Mississippi used to have new manufacturing plants popping up weekly? What happened? If you ask the business leaders, the problem is a lack of skilled labor. People don’t want to work. Especially in the Delta, people just won’t show up on time and often fail drug tests. “How can this be?” you may ask. You have to work to eat. Well, that’s really not true anymore. In fact, our welfare state rewards not working. You can do as well working one week a month at minimum wage as you can working a $60,000-a-year, full-time, high-stress job. It is quite easy to check my numbers, thanks to the Internet. In fact, it only took me a couple of hours on the net to gather this data. Almost all welfare programs have Web sites where you can call up “benefits calculators.” Just plug in your income and family size and, presto, your benefits are automatically calculated. Just to double-check, I looked at what our country spends on welfare at a national level. Backing out Social Security, the U.S. spends about $750 billion a year on welfare. The U.S. has about 120 million households. If 25 million get welfare (20 percent), that comes to about $30,000 per family. This figure pretty much backs up my analysis. The chart is quite revealing. A one-parent family of three making $14,500 a year (minimum wage) has more disposable income than a family making $60,000 a year. First of all, working only one week a month saves big-time on child care. But the real big-ticket item is Medicaid, which has minimal deductibles and copays. By working only one week a month at a minimum-wage job, a provider is able to get total medical coverage for next to nothing. Compare this to the family provider making $60,000 a year. A typical Mississippi family coverage would cost around $12,000, adding deductibles and co-pays adds an additional $4,500 or so to the bill. That’s a huge hit. The full-time $60,000-a-year job is going to be much more demanding than working one week a month at minimum wage. Presumably, the low-income parent will have more energy to attend to the various stresses of managing a household. If the one-week-a-month worker maintains an unreported cash-only job on the side, the deal gets better than a regular $60,000-a-year job. In this scenario, you maintain a reportable, payroll-deductible, low-income job for federal tax purposes. This allows you to easily establish your qualification for all these welfare programs. Then your black-market side job gives you additional cash without interfering with your benefits. Some economists estimate there is one trillion in unreported income each year in the United States. My analysis only includes the better-known welfare programs. One Web site I used, GovBenefits.org, gave me a list of dozens of additional programs and private grants available to low-income family providers. This really got me thinking. Just how much money could I get if I set out to deliberately scam the system? I soon realized that getting a low-paying minimum wage job would set the stage for far more welfare benefits than you could earn in a real job, if you were willing to cheat. Even if you didn’t cheat, you could do almost as well working one week a month at minimum wage than busting a gut at a $60,000-a-year job. I have left out the mother of all welfare programs – Supplemental Security Income (SSI). SSI pays $8,088 per year for each “disabled” family member. A person can be deemed “disabled” if they are totally lacking in the cultural and educational skills needed to be employable in the workforce. Ironically, most private workplaces require drug testing, but there is no drug testing required to get welfare checks. Granted, some of these welfare programs have restrictions to prevent double dipping. No doubt our efficient federal bureaucracy does a bang-up job of preventing such fraud. NBC Orwellian scrubbing of Obama health care knowledge?, Big Brother Obama pressure?, You’ll be able to keep your health care plan lie, Ministry of Truth rectifies? I began comparing the Obama camp to “1984” and Nazi Germany by early 2008. Why? I was paying attention and have studied history. Numerous obots, rabid Obama supporters and those under the influence of the Obama Thought Police insulted me & my commentary. How many of those people are so inclined now? Obama knew by at least 2010 that his often quoted line was a lie. George Orwell, prior to wrting “1984” had watched the regimes in Nazi Germany and Stalinist Russia. Beginning in 2008, articles critical of or revealing about Obama were sanitized or scrubbed from the internet. We learned to save copies of articles. We have another recent example. The mainstream media, in what I believe is an attempt to not be left behind in the truth being revealed about Obama, has begun exposing Obama. NBC just did so, then the article disappeared. The it resurrected with a paragraph missing. Then the paragraph appeared. They got caught. Why it happened I will leave to the reader to surmise. From The Blaze October 29, 2013. “NBC News is claiming that a “publishing glitch” caused its bombshell investigative report on Obamacare to disappear for a period of time. The news outlet has since republished the scathing article, however, a key paragraph was temporarily removed — and no editor’s note explaining why was included. The article in question revealed that the Obama administration knew at least three years ago that millions of Americans would not be able to keep their health insurance under Obamacare. But that didn’t stop President Barack Obama and other administration officials from promising the opposite, the report suggests. “With the deep, unconscious sigh which not even the nearness of the telescreen could prevent him from uttering when his day’s work started, Winston pulled the speakwrite towards him, blew the dust from its mouthpiece, and put on his spectacles. Then he unrolled and clipped together four small cylinders of paper which had already flopped out of the pneumatic tube on the right-hand side of his desk. Serco, the apparent top dollar contract recipient of Obamacare, is being investigated by the British Government. From Reuters October 25, 2013. “The chief executive of outsourcing firm Serco has quit as part of a major reorganisation aimed at rebuilding its reputation with its biggest customer, the British government, following a series of scandals. The UK government, which accounts for about 25 percent of Serco’s revenue, said in July it would not award the firm or rival G4S any new contracts pending a review of existing ones, after an audit discovered they had charged for tagging criminals who were dead, in prison or not being monitored. From Free Republic October 20, 2013. Of course, CGI, the apparent number 2 recipient of Obamacare contract dollars (for now), is also embroiled in controversies. From Citizen Wells October 25, 2013. “Is this another case of Barack and Michelle Obama involved in crony capitalism or just poor judgement? Government is not the best means to do anything well, especially with crony capitalism, instead of real capitalism. From Zero Hedge October 27, 2013. “You didn’t want to be the guy chosen to tell Stalin that the wheat crop failed or the production quotas on trucks and cars were not met. Why? Because despots always blame people, not systems. In the same way, you don’t want to be the guy chosen to tell Obama that his health care websites are a disaster. But that’s what they are, and he’s managed to blame everyone but himself. At his hilarious and embarrassing press conference on Monday, the president first assured us that “no one is madder than me” about website failures. Then, of course, he lashed out at the critics and implicitly blamed them for technical failures. Someone needs to explain to this guy that rooting one way or another does not cause a website to fail. Crop failures in Russia were not because of the enemies of communism, and the failure of Obama’s health care websites are not due to his political enemies, either. The problem is that government is a bad developer, even when it’s contracting out. There he goes again, defining his own reality. By plunging into direct provision of a commercial service and forcing people to cough up for it, Obamacare and its website must be prepared to be accessed just like any other private market service. People don’t like it when websites are flaky and do not perform. By dismissing this feature — treating the website as if it is just a luxury feature that has nothing to do with the program itself — he reveals that he’s stuck in the past. A website is not just a convenience. It is the heart and soul of a service that purports to serve everyone. In some ways, this is the most important website this government has ever produced. People don’t use the sites of the Pentagon or Housing and Urban Development. But this one people not only use, but are forced to use. Its failure is epic. The president then made matters worse. He pointed out that people can download a form and mail it in. Also that people can go to centers where there are people who can help. Then he even rattled off an 800 number that people could call. Busy signals? I think the last time I heard one of those I was in seventh grade. No one under the age of 25 even knows what a “busy signal” is. “The problem is that government is not the best means to do anything well. The problem is the absence of two crucial things: the knowledge to assemble the resources properly and the means to make the economic assessment of the value of competitive resources. This is what happens when you eliminate the profit-and-loss system. You can throw massive resources at a problem with the end result being disappointing. Again, it is not just about the website. It is about the whole system. The fools who imposed this system had all the expertise, all the arrogance, all the money, and all the power, and they still couldn’t do it. Meanwhile, hundreds of thousands of workable and useful websites go up every day. Thanks to CDR Charles Kerchner for the heads up. Is this another case of Barack and Michelle Obama involved in crony capitalism or just poor judgement? Toni McCall Townes-Whitley, who was in Michelle Obama’s class at princeton, is a Senior VP at CGI. From the Association of Black Princeton Alumni. CGI was the lone bidder. From The Washington Examiner October 13, 2013. “Federal officials considered only one firm to design the Obamacare health insurance exchange website that has performed abysmally since its Oct. 1 debut. Rather than open the contracting process to a competitive public solicitation with multiple bidders, officials in the Department of Health and Human Services’ Centers for Medicare and Medicaid accepted a sole bidder, CGI Federal, the U.S. subsidiary of a Canadian company with an uneven record of IT pricing and contract performance. “The multiple awards were in the form of “task orders” for projects of widely varying size. 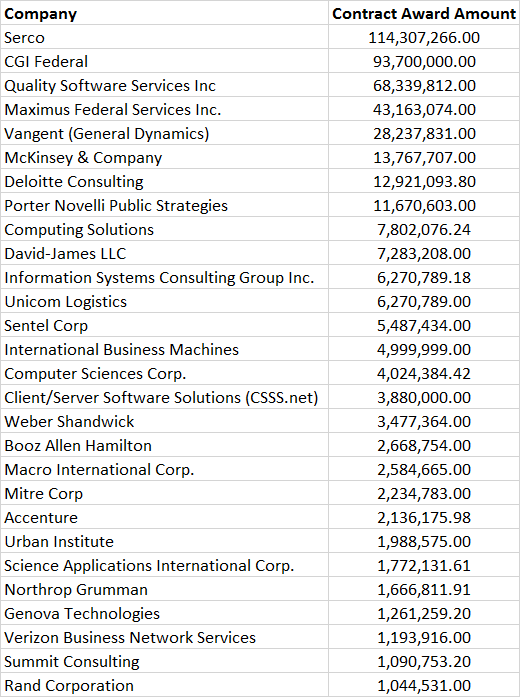 Over the life of the CGI contract — which expires in 2017 — the IT firm can receive awards worth anywhere from the “$1,000 to $4 billion,” according to a contracting document provided by CGI to the Washington Examiner. This is apparently the route chosen by CMS officials in awarding the Obamacare Healthcare.gov website design contract to CGI. “The first indication of questions of CGI performance and pricing came in February 2010 when the firm protested a $230 million CMS contract award to Computer Sciences Corp. Inc. In a sharp rebuff to CGI in November 2010, General Accountability Office acting counsel Linda H. Gibson denied the CGI protest. “As the Examiner previously reported, CGI in Canada also suffered embarrassment in 2011 when it failed to deliver on time for Ontario province’s flagship project a new online medical registry for diabetes patients and treatment providers. Obama’s history of crony capitalism is extensive and includes another Princeton grad, John Rogers. From Citizen Wells October 23, 2011. “During this period, campaign finance records show, executives from Ariel, Loop and two other leading Chicago investment firms, Holland Capital Management and Capri Capital, sharply increased their donations to Mr. Obama’s State Senate campaign fund. And once he began his campaign for the United States Senate, they quickly became a fund-raising core that has carried over into the presidential race. “Still, things have not worked out as well for some of the investment managers. Both Ariel and Holland were given several hundred million dollars to invest. Below are exerpts from the House Oversight Committee letter to Steve VanRoekel, U.S. Chief Information Officer and Administrator, Office of Electronic Government Office of Management and Budget and Todd Park, U.S. Chief Technology Officer Office of Management and Budget. The letter paints a disturbing picture of the implementation of the Obamacare website and confirms many of our suspicions. “Normally a system this size would need 4-6 months of testing and performance tuning, not 4-6 days,” the individual said.